Issued from 1894 to 1930. First published by Augener (to Piatti's death in 1901), thereafter taken over by Schott. Schott often reissued arrangements they published independently much earlier in the series after they took it over in 1901, so the dating can be confusing. There also seems to have been some re-numbering of items when the series was absorbed by Schott, whose previous series of arrangements by Swert, Schröder and Moffat were incorporated. This series was assembled over a period of 70 years, but the name seems to have been coined in 1919. It consists of several collections of Baroque sonatas by four main editors which had been published between 1860 and 1900. These were brought together in single series, with a total of over 60 works. Piatti's arrangements were initially published separately, starting with a Boccherini sonata in 1865 (Hofmeister's Monatsbericht (1865), p.201). The complete list is here. They were collected as Oeuvres Classiques from 1894. Later the six Ariosti sonatas were added to Dessauer's viola arrangements (ca 1900) from the Alard Les Maîtres classiques du violon series, and issued as Klassische Sonaten ca.1930. The next set of arrangements to appear was that of Alfred Moffat (1866–1950), a Scot who was active in Germany until the First World War, and the youngest arranger at that time. 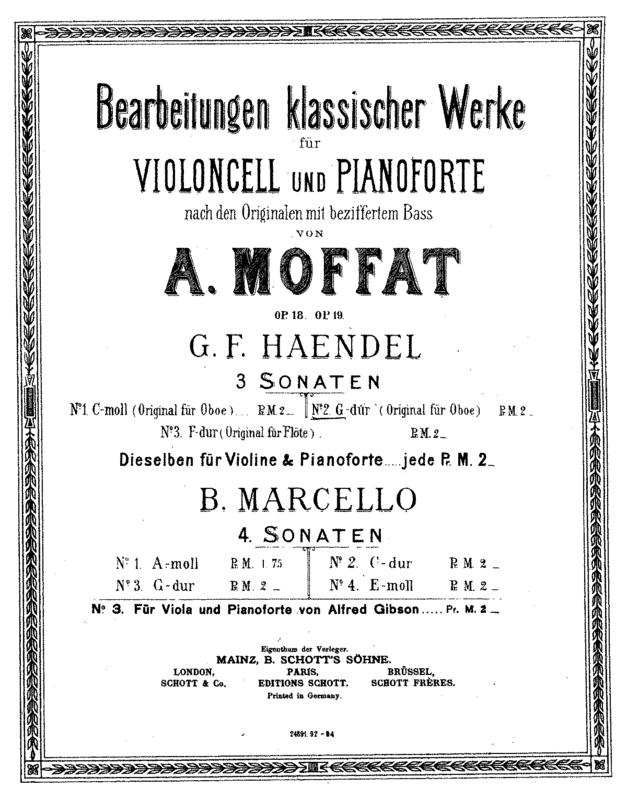 Schott published his arrangements of Marcello (4 sonatas, later CL 60 and 61) as Moffat's Op.18 (the practice of the time) in 1890, and then Handel, (3 sonatas originally for oboe, later CL 57-59) as Op.19 the following year. These were combined in one volume entitled Bearbeitungen Klassischer Werke fur Violoncello mit Pianoforte. The title page is attached to the Handel G major sonata (HWV 363b), shown below. Soon the publisher combined these seven pieces with Piatti's (excluding his Ariosti works CL 7-11)and de Swert's in a series entitled Sonates Classiques pour Violoncelle. This included the items later numbered CL1 to 6 by Piatti, 13 to 21 by de Swert and 57 to 64 by Moffat, along with some other arrangements. 14 of Moffat's arrangements were finally included in CL. At this point the collection contained about 25 pieces, and was rather unfocussed, including some classical pieces (Boccherini, Beethoven). Finally the last of the three founding editors of roughly the same generation (born 1850-1870) appears. Carl Schröder was a contemporary of de Swert but lived 40 years longer. He was a very productive composer in many genres, but apart from an early Duport arrangement (1872) waited until the 1890s to produce two collections of Baroque pieces, published by Augener of London. Schröder's collections were both on a large scale. First there was a ten-volume collection of 59 short pieces from 1894, covering over 230 pages in piano score, entitled Vortragsstudien. Eine Sammlung hervorragender u. beliebter Tonstücke alter Meister (Old Masters or Studies in Style in English). The second collection, was even more ambitious, larger than Piatti's and Moffat's combined, entitled Klassische Violoncell-Musik berühmter Meister des 17. u. 18. Jahrhunderts known as Classical Cello Music in English (1894-95). This collection grew to 31 pieces (see contents lists above) which were later incorporated into CL as items 20-50. Moffat produced arrangements for other publishers starting in the 1890s. They include Augener, Breitkopf and then some series for Simrock. He started a rival cello collection, slightly smaller than Schröder's (18 pieces compared with Schröder's 31) entitled Meister-Schule der alten Zeit: Sammlung klassischer Violoncell-Sonaten berühmter Componisten des 17ten und 18ten Jahrhundert, which Simrock issued in 1904. This followed the success of his 30-item similarly-named violin series (1899~). While de Swert (1843-1891) and Piatti (1822-1901) died before the whole collection appeared, Moffat and Schröder happily lived to see the library brought together under its new name, and to be established as the standard source for baroque cello repertoire. Although the Urtext movement has to some extent superseded these editions, they are still widely used by amateurs. As for the series as a whole, the last item in our list, number 81, was issued in the early 1930s. The latest date of those on IMSLP is 1930, according to the plate number 32701 on the Gabrielli sonata arr Lanthoff (No.76 out of 81 items). However the series continued, eventually encompassing all the cello repertoire. At first arrangers Koch and Weigel and Ewerhardt and Storck added about 20 Baroque pieces, mainly by de Fesch (CL 82-110), then in the mid 20th century Kolneder and Ruf contributed more 18th century pieces. After 1945 it seems that it was decided to "stretch the brand" to the Romantic era (Tchaikovsky, Fauré, Saint-Saëns) works, both original and arrangements, including cello ensemble, and also to late 20th century composers such as Penderecki. In fact, the present catalog contains 270 works, over three times the number in 1920. Moreover, if Piatti, Schröder, de Swert and Moffat were by chance to go into a music store now, they would be pleasantly surprised to see some of the arrangements they made in the 1890s are still in print. A similar series of of Baroque sonatas, entitled Oeuvres d'auteurs anciens was published between 1918 and 1921 by the Paris branch of Ricordi, arranged by Joseph Salmon (1864-1943). See Salmon's work list. This series differed from the cello library in three main respects: many items were transposed from their original keys, many, such as Senaille's "Allegro spiritoso" from the Violin Sonata in D minor Op.4 No.4. These arrangements often consisted of one or two movements, instead of complete sonatas, and all works in the series were published in both cello and violin arrangements.